We'd decided that the master and slave clutch cylinders could do with replacing as the seals were very likely gone on both. The slave cylinder was first to come off. 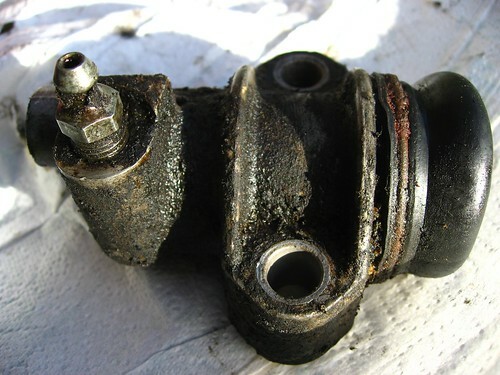 This is the slave cylinder off, but without the piston. It was pretty easy to unbolt from the chassis, but the hose was totally seized to it and took a couple of days' treatment with WD40 and final pipe-wrench assistance to free. The top of the hose was tricky too as it was right next to the new brake lines and with the engine in place the steel clutch line connection was tough to get access to. In the end it turned out the line was totally rusted to the connecting bolt and sheared through under pressure.